Gelair™ Health-e Bilge delivers the powerful anti-microbial and anti-fungal action of Pure Tea Tree Oil in a safe and effective biocide solution which disrupts and destroys biofilms present in vessels within the marine environment. Biofilms (commonly referred to as slime) can build up wherever there is sufficient water, nutrients and microorganisms. All vessels will have a bilge well or compartment where a residual mixture of fluids produced during normal marine operations will gather. Left untreated the residual bilge water will create an environment conducive to the growth of biofilm, which will adhere to contact surfaces, foul internal system fittings and create unpleasant odours. Gelair™ Health-e Bilge provides a unique solution which will complement your vessel’s existing bilge water treatment system by stopping odours and disrupting the algal growth created by the decomposition of residual oil and fuel. The unique pod delivery system of Gelair™ Health-e Bilge will float on the surface of any residual fluid and should be installed near the lowest point of your vessel wherever most of the bilge water accumulates. Gelair™ recommends securing the black pod (using a cable tie) to a fixed fitting clear of any bilge system valve or inlet/outlet fixtures, so as not to create any system suction hazards. 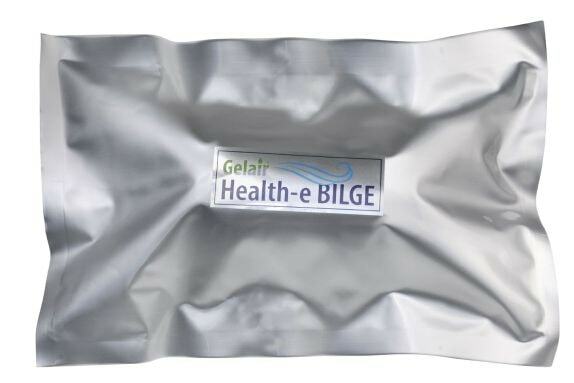 The pod delivery system of Gelair™ Health-e Bilge is available in two sizes, small and large. The small pod is suitable for small pleasure craft, yachts and dinghies whereas large pods should be used for industrial maritime machinery spaces and larger vessels including superyachts.